My dad was not a chef. In fact, I can count on one hand the number of times I remember him showcasing any culinary expertise: carving the Thanksgiving turkey; carving the Christmas Prime Rib; cranking homemade ice cream on the 4th of July; turning the marinated chicken quarters on the Weber Grill; and making a double batch of pecan pralines in December. I don’t know where the recipe originated or even why it was special to Dad, but about a week before Christmas he would begin his annual candy-making ritual. 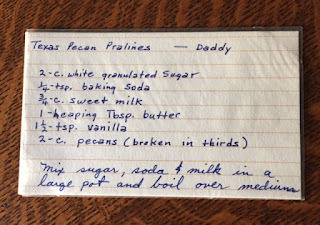 He had a special pot in which he made the pralines. It was a light-weight aluminum no-name pan, but he swore it was the only pot that worked. 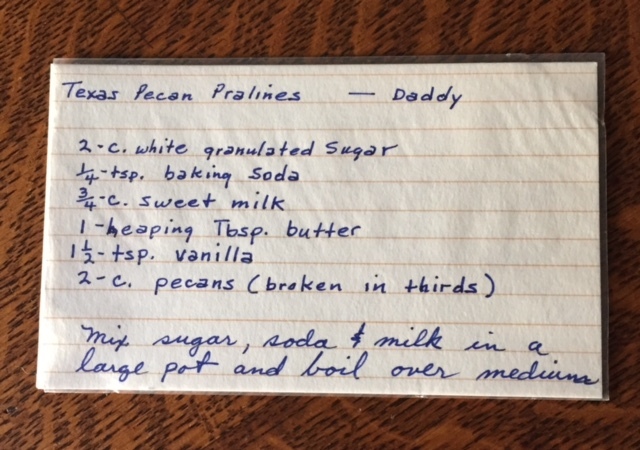 His candy thermometer was as old as the pot, and I think only used this one-time a year. 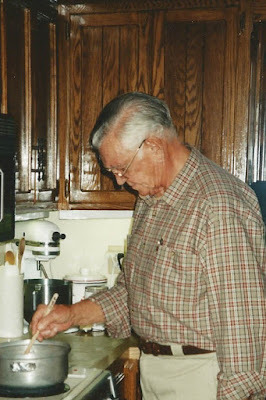 He had a red kodak kitchen timer that he would faithfully set when beating in the butter and vanilla. My favorite part was licking the pan of the caramel, sugary goodness. A delicacy I reluctantly sacrificed when my son was old enough to appreciate this special treat. I have yet to try to make these delicious morsels on my own. I found Dad’s process rather intimidating. Perhaps this year I will try my luck, anticipating a few mishaps but knowing that practice will make perfect. Mix the sugar, soda, and milk in a large pot and boil over medium heat to soft ball stage (235 degrees on a candy thermometer). Be sure to stir constantly with a wooden spoon. Remove from heat immediately and add butter and vanilla. Beat for five minutes using the wooden spoon. Add the pecans and stir just enough to coat each piece with the syrup. Drop on waxed paper with a teaspoon. Let cool. This post is part of BethFishRead’s Weekend Cooking Link Up. For more delicious recipes, please visit her weekly blog feature. That recipe card is a treasure! What a wonderful memory forever and always! The picture of your dad is priceless! I plan to make these during the holidays. Thank you so much for sharing!